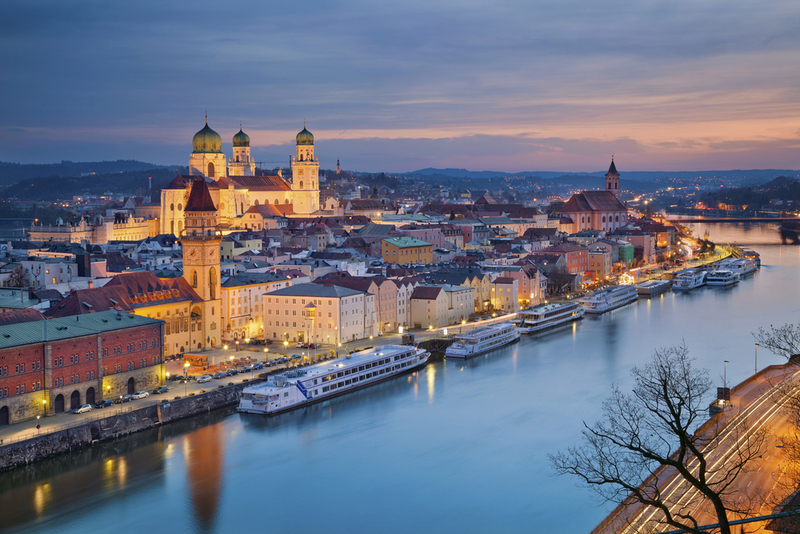 Will you be visiting Passau Germany? Maybe on a riverboat cruise or backpacking or road-tripping through Germany? If you are wondering about Passau Germany and what to do when you visit, you have come to the right place. I visited Passau Germany on my Viking Grand European Tour, and it was my favorite German city. Known as the “City of Three Rivers” Passau Germany is situated where the Inn, Ilz and Danube Rivers join one another. Over 50,000 people call Passau home. Also, Passau literally sits at the German-Austrian border and is the last major German city on the Danube before entering Austria. 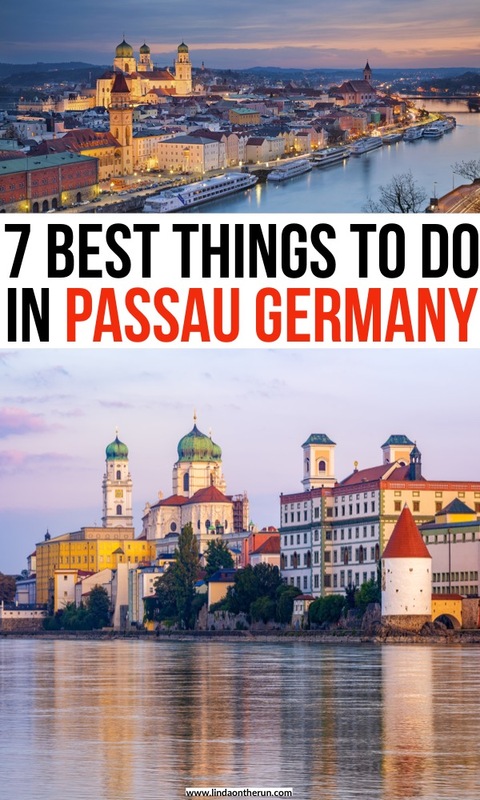 Here I have listed for you 7 of the best things to do in Passau Germany. I hope you like the city as much as I do. A lot of Old Town Passau Germany is nestled onto a thin peninsula of land that separates the Inn and the Danube Rivers. And there is no better way to learn about Passau than to walk around and explore. The delightful old-world cobblestoned streets will take you past pastel building facades of delicate rococo architecture. 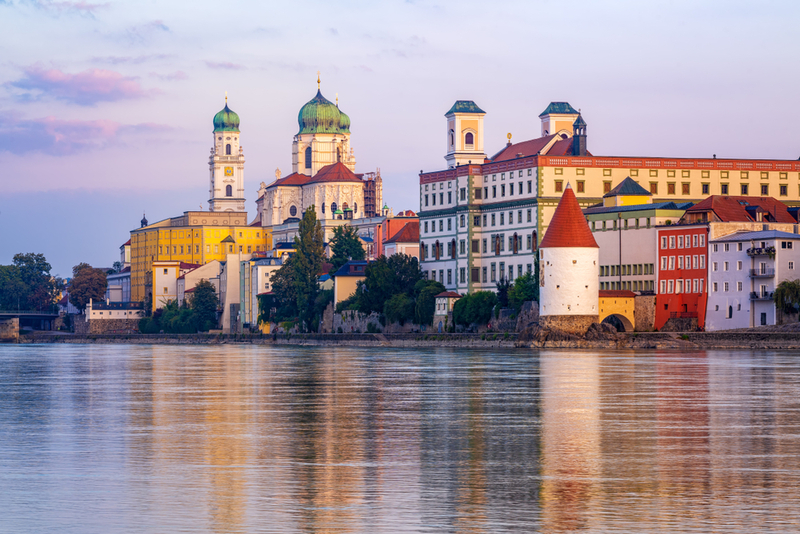 Passau Germany may even remind you of being in Italy with its medieval Mediterranean architecture. You will meander past chic high-end shops and historic buildings sitting side by side. You will stroll by the underpasses and archways that lead off the main streets and onto to other streets less traveled but no less interesting. Old world and authentic cobblestoned streets are sometimes uneven. I would suggest when visiting Passau that you wear comfortable and stable shoes to walk the city. I like these Skechers flex appeal walking shoes because they are inexpensive and come in lots of colors. They are slip on so you do not have to tie and untie the laces every time you wear them. I like that too. 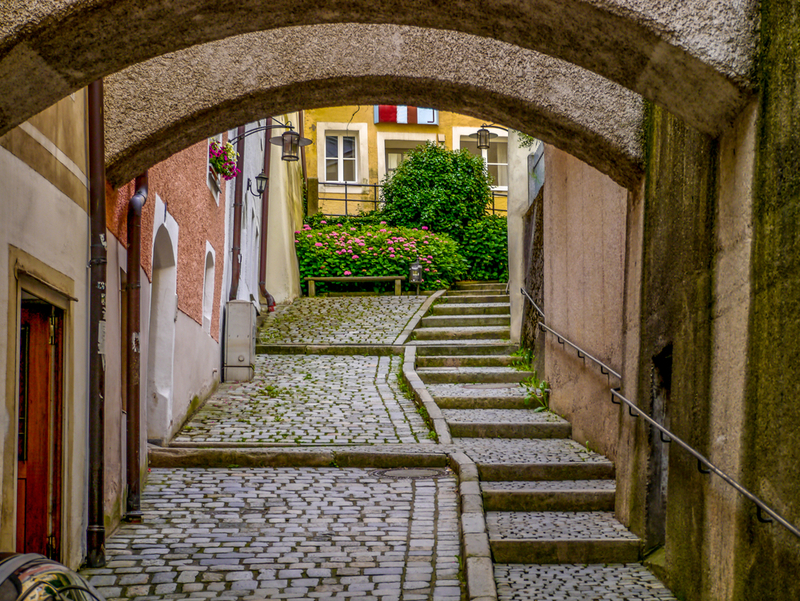 Be sure to make your way to Old City Passau (Die Altstadt). In the tiny square there is a magnificent fountain, and the medieval old bishops’ Residenz and the new Baroque bishops’ Residenz. Throughout Passau’s history, the prince-bishops have lived and ruled from these two buildings. Charming Passau Germany cobblestone street. To date, St. Stephen’s Cathedral ranks as one of the most stunningly beautiful churches I have ever seen. Ornately decorated in the Baroque style of architecture, it is visually magnificent. You will want to take your time walking around inside so as not to miss out on any tiny architectural detail. 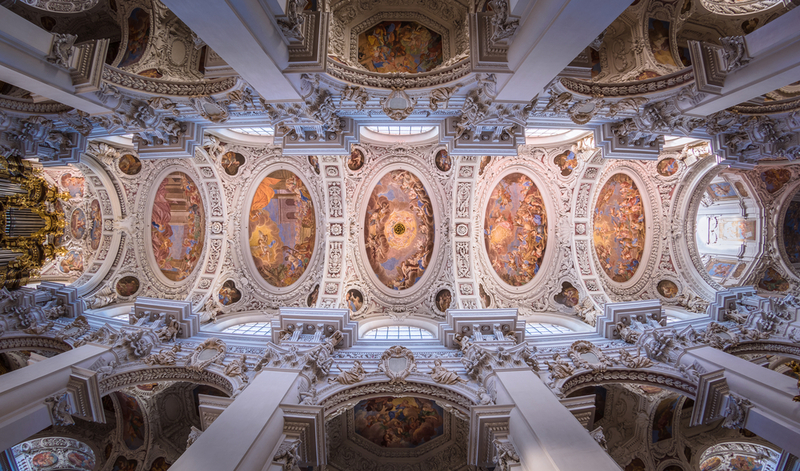 Jaw dropping ornateness of the Baroque interior of St Stephen’s Cathedral in Passau Germany. 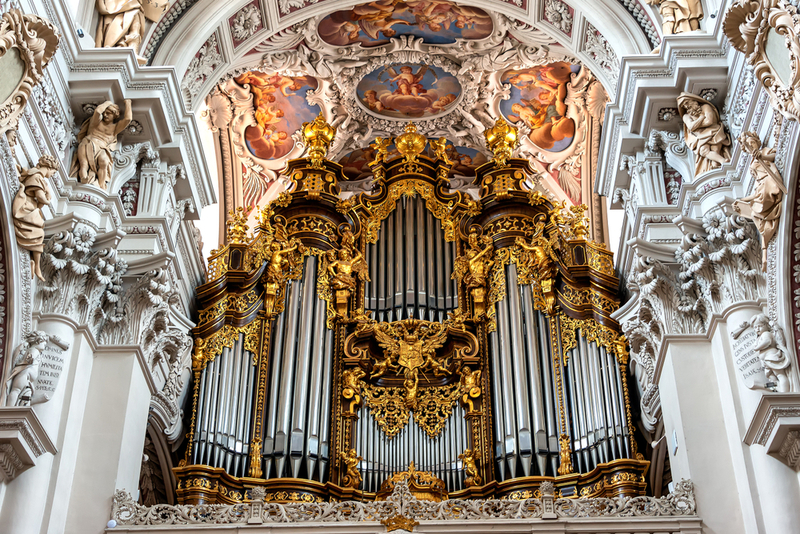 St Stephen’s Cathedral in Passau Germany is home to one of the largest pipe organs in the entire world. I was fortunate enough to attend an organ concert while visiting Passau, and the organ sounded like perfection. The acoustics of the cathedral were excellent. Rathaus is German for Town Hall. The historically painted building in Passau Germany is built on a former fish market site along the right bank of the Danube River. Being located on the confluence of three European cities means flooding is always a potential danger for Passau Germany. You will notice as you explore Passau that there are markings on sides of buildings indicating the high water levels of past floods that invaded Passau. None is more visible than on the side of the Town Hall. It is a stark reminder of the power the three rivers have over Passau Germany. 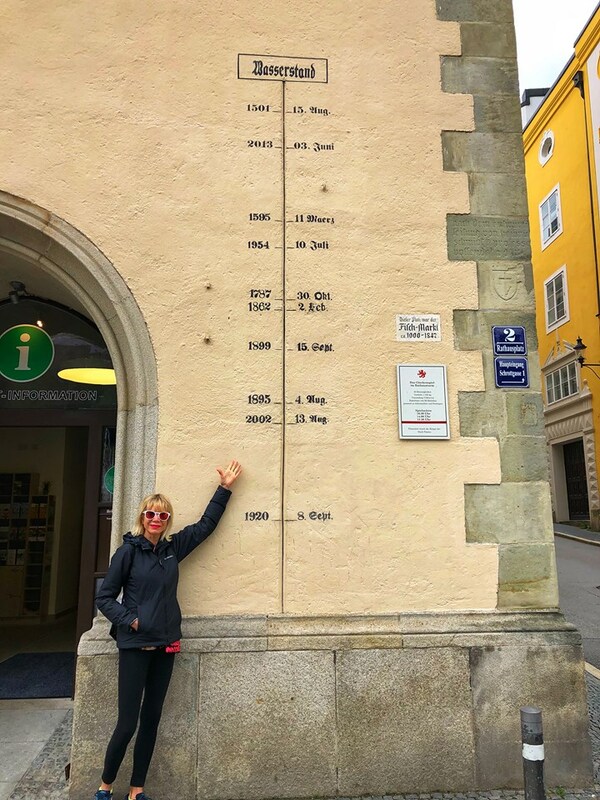 Here I am in Passau Germany, at the Rathaus, pointing to the floods high water scale on the building’s wall. While exploring Passau, you may want to bring along some water in a nondisposable water bottle. My family and I never leave home without our Bobble filtered water bottle. It comes with a changeable filter which means clean fresh safe water at any time. That is such a relief and no more plastic water bottles to throw away. The 18-ounce size is perfect for the pocket of your backpack or even to hold onto because it is not that heavy. Located just steps from the Town Hall, the Glass Museum is the largest bohemian-style European glass collection in the world. It is estimated to hold over 30,000 glass pieces. If you are into historical glass collections, this is an interesting museum you will want to consider spending time at. Consisting of four floors worth of both privately held and public glass collections this is a great way to stroll away a few hours while in Passau Germany. I remember my fellow Viking passengers who visited the glass museum speaking highly of it. Lovely Passau with St. Stephen Cathedral Spires in the background. Legend has it that a Hapsburg emperor prayed incessantly to Mary in this simple church to protect Vienna and his vast empire, and legend has it that because of his praying to the Virgin Mary, enemy armies withdrew. Due to this miracle, this modest pilgrimage church is revered and visited by locals and tourists alike who pray for their own intentions. The church sits atop the hill from Passau on the Inn River. When I visited Passau Germany I walked everywhere as the town and its historical attractions are all quite compact. If walking, you will walk through Passau and cross the Inn River. What an amazing sight that is, Mariahilf Hill before you and Passau behind you. 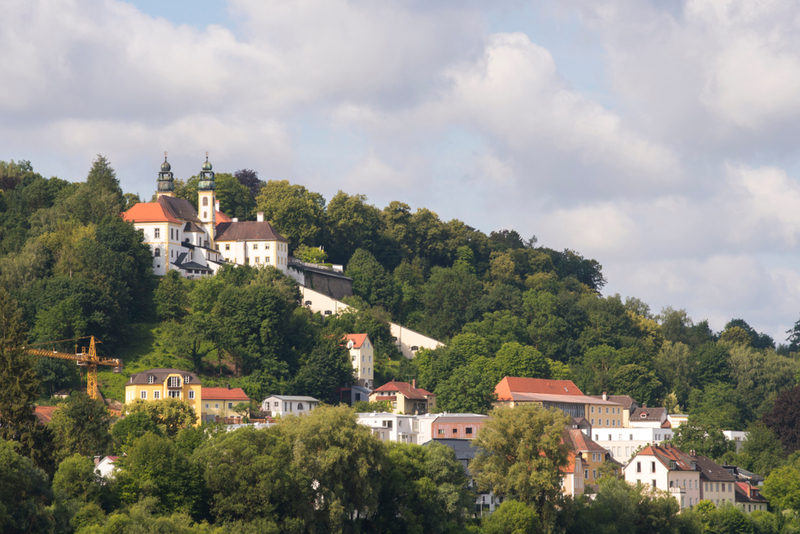 This simple Baroque-style church can be reached on foot by climbing the “heavenly ladder,” a 321 foot covered staircase from Passau to the top of the hill. The walls and stairs are full of thank you’s to the Blessed Virgin for miracles granted in response to fervent praying. You will see wheelchairs, canes, crutches all around that are no longer needed. Pictures of loved ones cured are on the walls. If there are infirm, sick or wheelchair-bound persons in your party that wish to pray at the pilgrimage church an Uber or taxi is the best way to transport them there. You can see the spires of Mariahilf Pilgrimage Church high on the hill. The Veste Oberhaus is the imposing fortress situated atop St. George’s Hill, between the Danube and Ilz Rivers. From its perch, you will be rewarded with stunning views of Passau and the surrounding countryside. Not everyone is into climbing the 200 steps to the top so you can rest assured there is a bus you can catch in Passau that will comfortably take you and your traveling party up the hill to Veste Oberhaus. Check the bus schedule when you are in Passau German, but I believe it was every 30 minutes during the fall when I was there. The fortress has been renovated and refortified several times throughout history and retains Gothic, Renaissance and Baroque architecture for you to view. 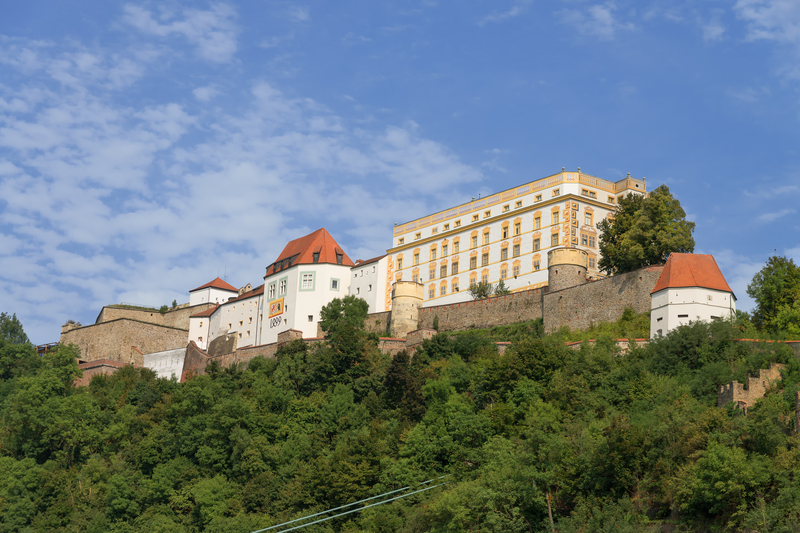 There is a museum inside the fortress that offers six centuries of history to explore along with historical exhibits about Passau and the wider region around it. There is also a restaurant for refreshments and a viewing platform on the Observatory Tower for picturing taking of the magnificent view of the rivers below, charming Passau Germany and the bucolic countryside. If you will be out in the sunshine during your visit to Passau Germany you may want some sunglasses to shield your eyes from the sun. These unisex polarized vintage sunglasses are trendy, come in several colors and are cheap. These sport sunglasses are also polarized and UVA/UVB protection. Both are excellent options. The mighty fortress, Veste Oberhaus, above Passau Germany. For a true Bavarian experience, rent a bike and get pedaling. If you do not ride a bicycle that often, no worries. Besides the traditional bicycle, you can rent an e-bike or a tandem bike. E-bike does the pedaling for you and is quite a thrilling experience. On a tandem bike, you do have to pedal but there will be two of you to share the load. You can rent your vehicles in Passau and head off on your own to explore the bucolic German-Austrian countryside or hire a guide. Begin by riding along the Inn River enjoying unspoiled Bavarian nature and waterscapes along the river. It will not take very long once you leave Passau Germany for the scenery to change drastically from city to farm fields. You could see corn or wheat fields. And small forests dot the river where birds of all types reside. Enjoy riding and in a few miles, you will arrive at the German-Austrian border, and the town of Wernstein, Austria. Historic Wernstein built around a fortress and changed hands several times between Germany and Austria, and today it is situated on the Austrian side of the border. At Wernstein, cross the bridge over the Inn River and you will resume your bicycling through Austria until you return back to Passau Germany. Fun fact: to cross the Inn River from Germany into Austria, you are required to get off your bike and walk over the bridge. Ro riding across the bridge is permitted. Please confirm whether or not you will need your passport before you begin your international bicycling expedition. While on your bicycle trip, you may find bike riding is a bit chilly, depending on the season of course. I always do. I suggest this Columbia nylon jacket. The nylon material will withstand the wind and it is very reasonably priced and comes in a jillion colors. My hands are always cold when I ride my bicycle and these touchscreen soft lining gloves are a great idea. They have an elastic cuff which will keep the chilly weather of the Inn River at bay. I loved my visit to Passau Germany when I visited. Over 50,000 people call Passau home. It is a lovely Mediterranean-inspired town that has a lot to offer. Have you ever visited Passau? Did you fall in love with it as much as I did? 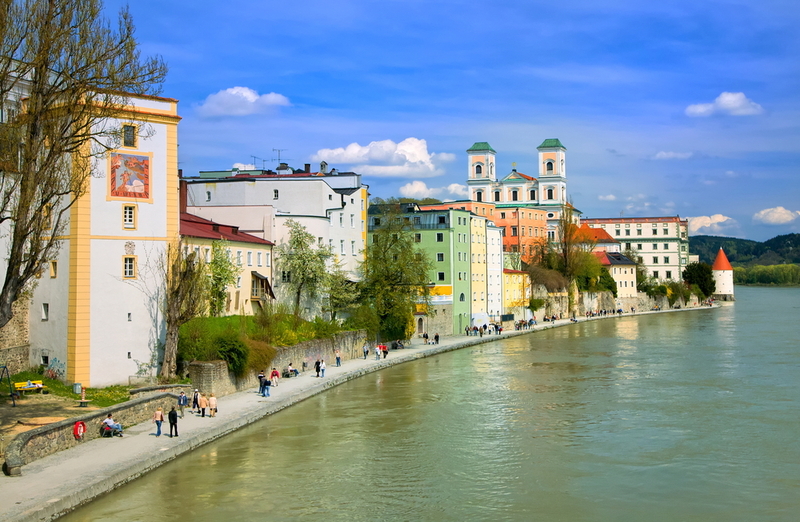 What other recommendations do you have for others traveling to Passau?